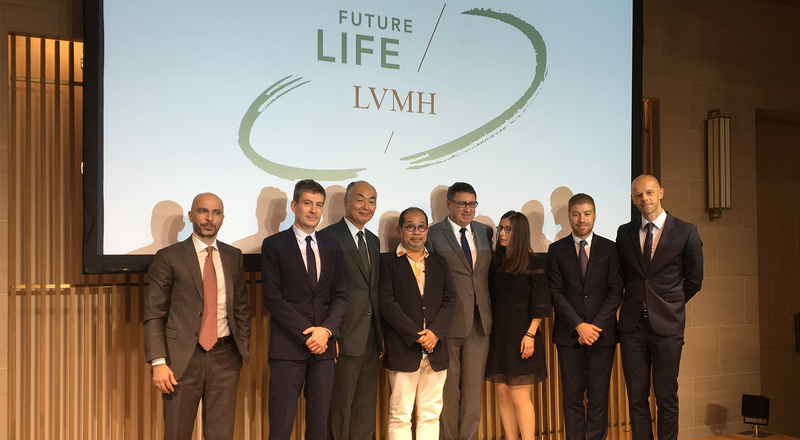 Future LIFE highlights LVMH’s lasting environmental commitment and the 25th anniversary of its Environmental Management team. LVMH chose Japan to celebrate this avant-garde approach with an unprecedented event, Future LIFE Japan, organized in Tokyo on May 30th. In this framework, renowned guests gave testimonials and talked about their past or upcoming initiatives with Norbert Leuret, President of LVMH Japan: Jun Aoki, a prestigious contemporary architect, and Rintaro Tamaki, former Deputy Secretary-General of the OECD. “LVMH has a long history in Japan, and a strong presence, with most of our Group’s Maisons being in this market. In addition to creating the best boutiques possible in Japan, and offering our latest creations, we share together with our clients the permanent objective of respecting the environment in our daily work. We take this as a priority and train our employees in this direction. So, Japan is a country where environmental issues are taken very seriously, which is also the case at the LVMH Group,” explains Norbert Leuret, President of LVMH Japan. The environmental experts and managers of several Houses of the Group were also present to review the 25 years of initiatives, but also to look to the future. A number of Houses thus joined together on May 30th, with Sandrine Noël, Environmental Manager at Louis Vuitton, Jérôme Grévin, QSE Manager at Glenmorangie, Fabrizio Ciafrei, Project Manager at Loro Piana, Enrique Ventura, Environmental Manager at LVMH, and Alexandre Capelli, Environmental Manager for the LVMH Group. “Apart from the headquarters of Christian Dior, LVMH and Vuitton, most of the activities in the archipelago come from our 412 stores. This is why we must encourage all effective approaches to reduce greenhouse gas emissions linked to our boutiques. The doubling of our carbon funds in 2018 goes in this direction, as does the LED retrofit lighting, helping to reduce these greenhouse gas emissions all the more quickly,” points out Alexandre Capelli, Environmental Manager for the LVMH Group. To understand this mobilization, it is necessary to understand the Group’s history. As the worldwide luxury leader, focused on a long-term vision for its activities, LVMH has a duty to set an example in terms of sustainable development. This is why LVMH created an Environmental Management team within the Group as of 1992. Already at the time, its goal was to accompany each of its Houses and to encourage collective participation in order to ensure their development over the long term while respecting the environment. “By integrating the ecological imperative as a source of innovation, we made this a key element in our growth strategy from very early on. For 25 years, the LVMH Group has been proud to be a precursor and promises to remain one. And Japan is amongst the leaders of this momentum,” underlines Toni Belloni, Group Managing Director. Since 2012, the Group and its 70 Houses have taken a stand via the LIFE program (LVMH Initiatives For the Environment), which involves them from the production to sourcing by way of sales or design. Mandatory in the strategic plan of each of our Houses, LIFE has been enriched with new objectives and becomes LIFE 2020, based on four pillars: “Products-Sectors-CO2-Sites.” This is also made possible by a cross-house measure: the doubling of internal carbon funds. The calculation will now be based on 30 euros per ton of CO2 produced. +10% for the EPI (Environmental Performance Index) of the Group’s products. 70% of leathers derived from tanneries certified by LWG (Leather Working Group). -25% CO2 emissions compared to 2013. 6.7 million euros invested in 2016 in the framework of the LVMH internal carbon fund. +10% environmental effectiveness of all sites and stores (water, energy and waste).